It’s all about the beans. If Lindsay Klaunig’s philosophy about making chocolate were to be summed up in a few words, those would be a good choice. 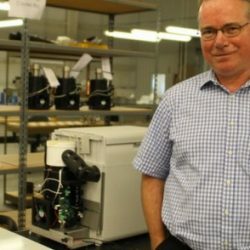 “If you really want good flavor and something unique, you have to start with the beans, you have to buy beans,” said Klaunig, explaining that some makers of chocolate bars will buy couverture chocolate and melt it down to make bars. For Klaunig’s new business in town, Trouvaille Goat Milk Chocolate, not just any cocoa beans will do. She has checked out beans from several different sources — including Hawaii, Peru, Brazil, Ghana and Ecuador — before deciding on beans from Vietnam for the chocolate bars she is now making in Athens. “That’s kind of a movement going on in artisan chocolate right now, it’s like this bean-to-bar movement where chocolate makers are focusing more on the flavor you get from the original bean rather than what you add,” Klaunig said recently as she made chocolate in the kitchen of the Appalachian Center for Economic Networks (ACEnet) in Athens. She gets her beans from a supplier in Eugene, Oregon, who works directly with cocoa (or cacao) farmers. Although she’s only been in business a few weeks, her bars are already available at six locations in Athens and one in Columbus. Klaunig said she’s made chocolate with cow and goat milk, but decided on goat. She uses powdered goat milk because the lack of water in it makes it work best for tempering the chocolate, a process that makes the chocolate shiny and “snap” when you break a piece off the bar. Klaunig said she hopes to figure out a way to use regular goat milk so she can make use of local goat dairies. The chocolate business is named for Trouvaille Farm, the dairy farm that she and her partner, Michael Barnes, own on Rainbow Lake Road. Trouvaille is a French word that means “lucky find.” It has significance because they feel lucky to have found the farm. They moved here from Martha’s Vineyard, Massachusetts, about a year and a half ago. “We were looking everywhere, just where the grass grows and you can afford land, and we found Athens,” she recalled. She has experience making cheese and operating creameries, he has experience managing farms. The farm on Rainbow Lake Road is a former dairy farm that hasn’t operated for several years. “We’re kind of restoring that now and hopefully can milk cows by fall,” Klaunig said. She said a number of things attracted them to Athens, including its proximity to metro areas like Columbus, and the fact that there is still room for new products in the area. While in Martha’s Vineyard she took a job as production manager at Not Your Sugar Mamas after her son was born five years ago, in order to have a better schedule than operating creameries allowed. That business makes vegan, raw super-food chocolate. The process involves stone-grinding the beans, which can take 10 to 24 hours (it’s not done by hand), then adding cocoa butter, sugar and the goat milk. 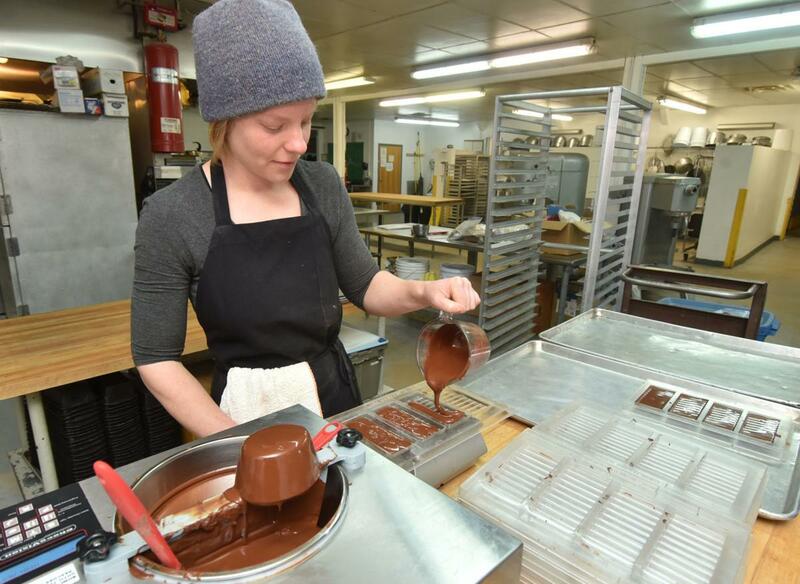 The chocolate then goes through the tempering process, then is poured into bar molds. The bars are sealed into foil-lined airtight pouches to preserve the flavor. The pouch she uses was designed by Red Tail Design of Athens. She said she wants the chocolate business to provide a second source of income. “I’d like it to complement our dairy income, I would like it to smooth out the seasonal income,” she said. Klaunig also wants to grow the business. Currently, she’s made arrangements for her bars to be in the following Athens locations: Donkey Coffee, White’s Mill, The Farmacy, Catalyst Cafe, Village Bakery and Hyacinth Bean. Klaunig can be reached at lindsay@trouvaillefarm.com.